Recent improvements in high speed Ethernet and processor technologies make it possible to build high performance network appliances on commodity hardware that rival expensive specialized hardware. And market requirements now dictate that network appliance solutions be offered with commodity hardware and virtual machine options for flexibility and cost savings. 6WIND software helps OEMs and Network Builders design and consume network appliances in months versus years. With software options for bare metal and virtual machine deployments, customers have an incremental upgrade path with the same software. 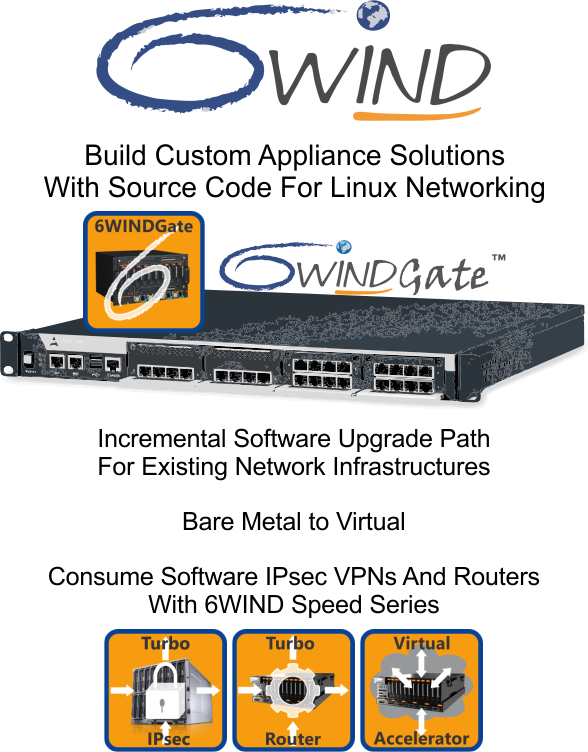 6WIND’s software gives OEMs and Network Builders bare metal and virtual deployment options to design hardware and software network appliances. 6WINDGate: A high performance modular software platform provided in source code to create the data plane acceleration foundation for applications. 6WIND Turbo Router and Turbo IPsec Appliances: Ready to use software appliances available for bare metal and VM configurations (router, firewall and IPsec gateway) that deliver unrivaled networking performance for Layer 2, routing, firewall, NAT, IPsec and more. 6WIND Virtual Accelerator: Reduces compute resources to maximize VM density and performance with non-intrusive virtual switch acceleration and network infrastructure features including multi-tenancy, routing and firewall. Eliminates SR-IOV and PCI Passthrough to preserve virtualization. Telcos Create your own, high performance, customized and open networking software appliances based on 6WIND technology on standard servers to reduce your networking CAPEX and accelerate service creation. Network Equipment Manufacturers Reduce your development costs and increase your margins for your new generation of network appliances based on 6WIND technology. Platform Vendors Provide the industry with high performance ready-to-use network appliances using your platforms and 6WIND technology.